Biblioblond's Blog | A blond trying to deal with biblio information overload. A blond trying to deal with biblio information overload. A common complaint in library school was the amount of group work that was required. The GIF posted above and found on Librarian Problems is hilarious to anyone and everyone who has gone through this experience. Many of the MLIS students in my cohort at McGill including myself were coming from a Humanities BA where marks were reliant on individual work in essays and exams. It was an especially huge learning curve because for all of our first-year mandatory courses there were at least two group projects. The atmosphere when a group project was announced was usually panic-stricken as the majority of librarians are introverts and in first semester we were essentially partnering up with strangers. As an extrovert, I was perhaps less stressed than my fellow students, I mean, I figured that since all potential group partners had been accepted into the Masters program I could only assume that we were all fairly intelligent studious people. In retrospect, I was generally lucky to have “good groups”. Around me I could see people who took group work to the extreme forcing their fellow group members to spend hours longer than required on projects in the attempt of attaining a perfect assignment. Other group members could go AWOL without notice leaving their groups in the lurch. The only bad experience that I had in a group (that will not be named to protect the innocent) seemed so disastrous at the time but 5 years later I brush it off knowing what it taught me in diplomacy and the importance of knowing when it’s time to cut your losses. Now as the only librarian in my schools I honestly miss the group dynamic. I miss having other librarians to bounce ideas off or to work collaboratively on a library-focused project. The skills that I learned in group work are still there and I made some good friends during these projects. So much that I was tagged 3 years after graduation in a friend’s Facebook post about that featured this GIF making fun of our shared experience of group work. If you are in library school now, don’t worry, you get through the group projects and to those who clench up looking back upon those assignments, what was your best or your worst group experience? Do you ever talk to those people anymore or have they developed into lifelong friends? Being on the selection committee of a literary prize is something that has always interested me. Perhaps what appealed to me was the power trip of having my opinion count for so much (pretentious? Yes, I know). The best way to remove pretension from book awards is having them be truly chosen by readers of a larger audience. The Ontario Library Association has an excellent example of a readers’ choice Book Award for young people called “the Forest of Reading”. The Forest of Reading is broken down into different categories (the names of different tress) in terms of reading level and features Canadian authors. Last February when I was attending the OLA’s SuperConference, I kept running into Céline Marcoux-Hamade, the head of French Services at the Toronto Public Library (probably my dream job!). She was impressed with my involvement in the conference (I think her words were that I was young and energetic) and so she invited me to join the selection committee for the French categories of the Forest of Reading. The French books are read by French Immersion and Francophone children alike and there is Le Prix Peuplier (Picture books), le Prix Tamarac Express (easy novels) and le Prix Tamarac (novels). Our job on the selection committee was to read during the spring all of the recently published books submitted by publishers (over a hundred titles) and then collectively determine which books would become the final ten nominated finalists for each category. It is now in the fall and winter that children all over the province will read the 10 nominated titles in order to vote on their favourite title. Province-wide, the votes are tallied up and the winner is determined in the spring. I was ecstatic at the prospect of reading so many new children’s literature titles. When I opened the first delivery of books, I was like a child at Christmas but as the months went on and the boxes kept coming, the books piled up and I definitely started questioning my commitment. At one point I had to rebel for a month and read only adult fiction. The committee members were spread across the province and it helped a lot that we were sharing our opinions on a forum on the OLA website. I was reassured when others shared my opinions on certain titles and surprised when others praised books that I thought were mediocre or dismissed titles that I had really enjoyed. Through the whole process we were very focused on “What will the kids like?”. We were after all selecting books that would be read throughout the province by kids from kindergarten to grade 6. It was important that I read the books through the eyes of a child. Since I continue to love children’s literature and I work with kids every day, I thought that this would not be that challenging but sometimes I really needed to keep my adult expectations in check. In the end the 10 titles for the three French categories were selected and although I must admit that I do not agree 100% with some of the nominated titles (I think some “better” books got left off the lists) that is the result of working collaboratively with a committee. I am excited to introduce these titles to the kids in my two libraries and to see all of my hard reading pay off when they get passionate about the book that should win and hopefully in the process they will become aware of Canadian authors who they can continue to read after the contest is over. 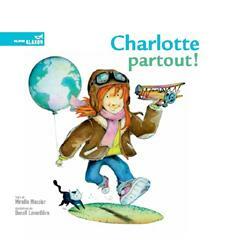 I am already organizing a school visit for Mireille Messier, one of my favourite children’s authors, who visited my library in New Brunswick and whose book Partout Charlotte is nominated for the Prix Peuplier! I strongly encourage those passionate about promoting reading to get involved in a selection committee like the Forest of Reading. I recently went to a presentation presenting “new titles” and I found that I had already read them all! For once in my life, I’m ahead of the curve! 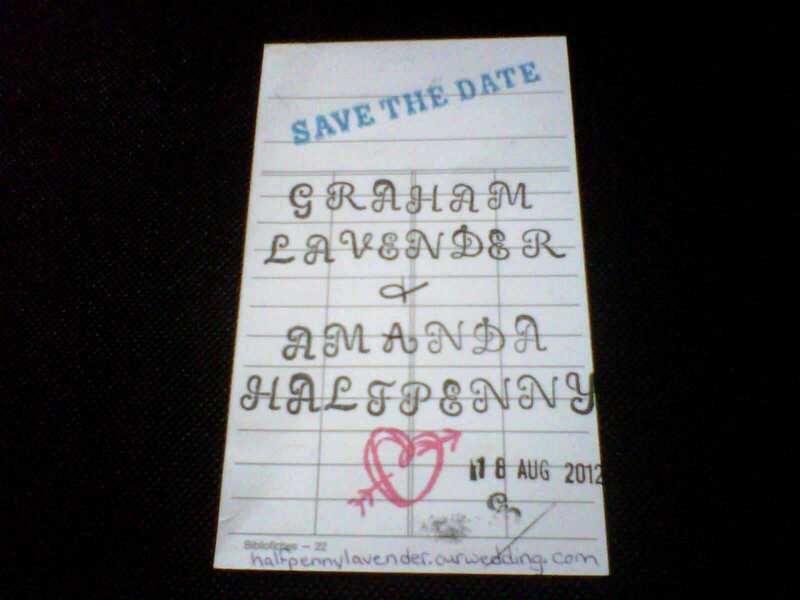 As my friends and colleagues know, last summer I married a fellow librarian Graham Lavender. 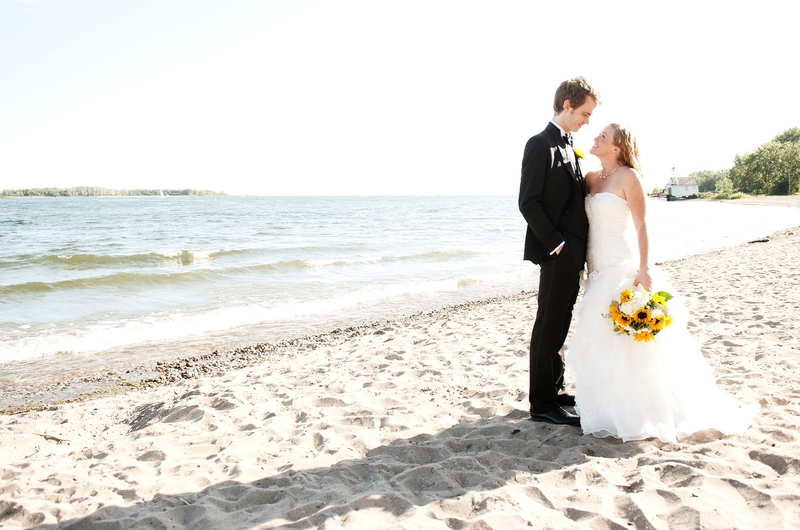 Graham and I met in 2008 when I began my studies at McGill’s School of Information Studies. I was part of a group of nervous first-year students and Graham was a confident second-year student available at the orientation to talk to my group, answering our questions and calming our fears about the course load and certain professors. We quickly connected and worked on many interesting projects together including co-organizing Web 2.You 2009. It was thanks to Graham’s encouragement that I got involved in library associations and was able to add so many fun and rewarding extra-curricular activities to my plate of experiences in library school. Fast forward a few years to our engagement and I knew that I wanted to somehow include our librarian profession in the wedding. I scoured the internet for any wedding decorations or themes related to libraries. I had a hard time deciding how prominently I wanted our librarian careers to become a theme for the wedding. It was important, despite nods to our chosen profession, that the wedding remain elegant (I recognized the potential of a library-themed wedding to be extremely cheesy). I found a few fun ideas like our Save the Date card that I made using old due date slips. Our guests loved these Save the Dates. They were simple to make (I am not a crafty person) and we got lots of compliments about how “cute” they were. They were a bit time consuming because I had to stamp each card one at a time and Graham helped out big time by writing our wedding website URL on the bottom of each card. In the end we were very happy with the results. 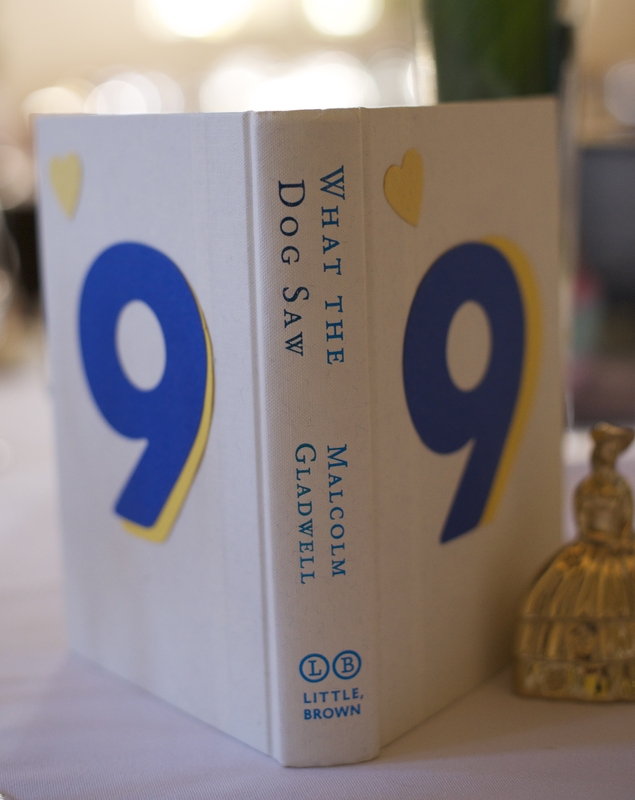 A few months be fore our wedding we attended another librarian’s wedding and I shamelessly stole her idea of using books as centerpieces with the table numbers. Again this project was very easy to execute; we found hardcover books that were white/blue/gray and then I bought pretty paper at Michael’s and cut out the numbers for each table. 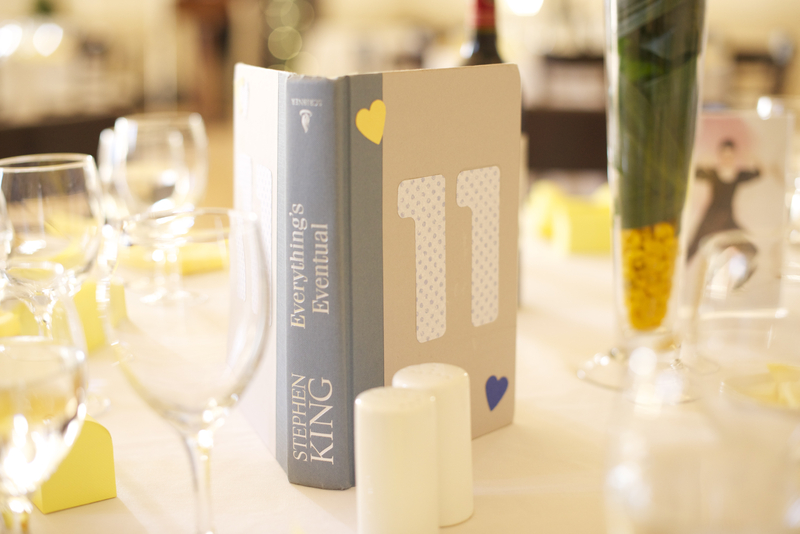 On some wedding blogs, I saw couples using books that had special significance for them. We did not put that much thought into the titles; we were happy to use any books we found on our shelves (and the bookshelves of family members) that would be sturdy enough to remain standing up and that would “look pretty”. In order to inform our guests of the seating plan, I printed (with a typewriter font) the name of each guest on a library due date cards. The cards were colour coordinated so that the servers could quickly see who had ordered which meal (white for veggie, blue for chicken, and pink for salmon). Each due date card was then put in a pocket that had the table number on it. The table numbers had been cut out of fancy paper (similar to the table numbers). This was fairly time consuming but totally worth it. The caterers organized the cards on a table in the lobby in alphabetical order. It was very easy for our guests before entering the reception hall to find their card and see at what table they would be seated. 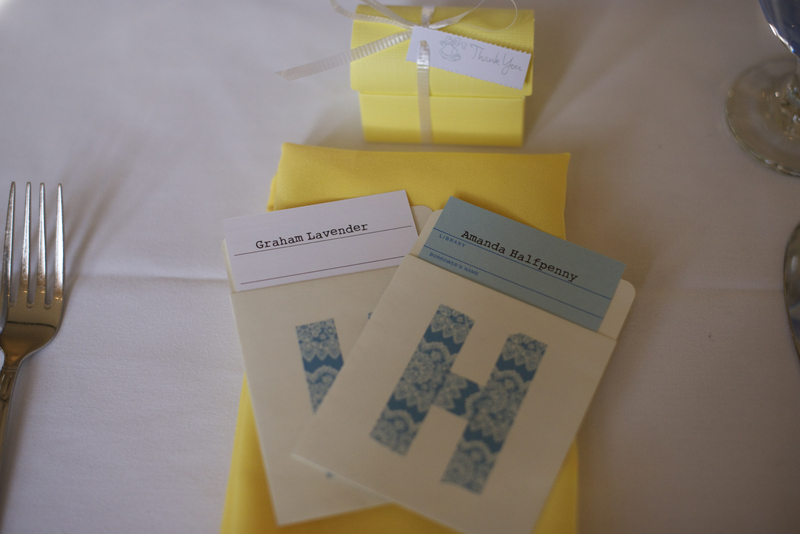 I was so focused on all of our guests that the head-table was a bit of an after-thought, so I ended up putting the letter H on the due date card pocket for “head table”. 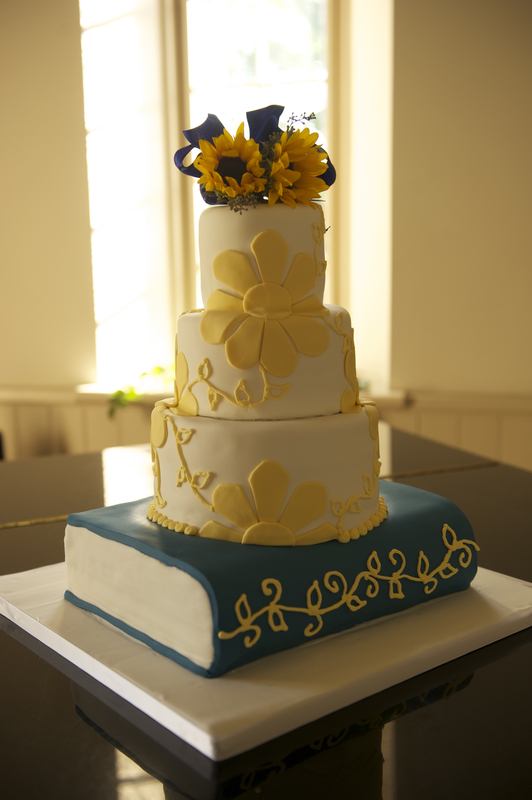 The most cre ative element to our librarian themed wedding was our cake. We were so lucky to have such a creative baker who listened to my vague idea (it would be fun if the cake had something to do with books) and designed a cake that was exactly what I wanted. Luckily, Jennifer, the cake-lady from Cakeaholic in Toronto, understood the vision of combining books with sunflowers and made the most beautiful and delicious cake. It was a huge hit! We had a fantastic day and if you are interested in seeing more pictures from the wedding, you can visit our photographer James Heaslip’s wedding blog. James was a great photographer and if you look closely in some of the photos you might even spot a few other librarians! In a time when so many libraries are trying to redefine themselves or rebrand their services, stories like the one of the Arlington Public Library in Texas, which is helping tornado victims find lost family photos, goes a long way to show how the request of one person can act as a catalyst for new service projects that have strong community appeal. I know unfortunately too many librarians who would react to this situation with “It’s not my job” instead of seeing the amazing opportunity to help preserve the community’s heritage and bring new people into the library. I strongly salute the staff at the Arlington branch libraries who looked beyond the obvious hard work involved and are now viewed as community heroes to the people who are rediscovering their lost photos! Based on the comment on their Arlington Public Library website, people are extremely excited about the service the library is offering. Visit the Eagle to read the whole article: Library helps tornado victims find lost photos. It seems that recently everyone has been talking about networking. When I attended NEL in February there was abig emphasis on networking and in the past few months I know a few people who have been very proactive about networking in order to find a job. Although I am not actively looking for a job, continuing to expand one’s network is always important. I found that reading the book Work the Pond by Darcy Rezac was extremely useful. It is a quick read and there are tons of tips that help us to understand how to be more effective in our networking attempts. Rezac uses the analogy that we are all frogs and when it comes to networking you need to kiss a lot of frogs before you find a prince. 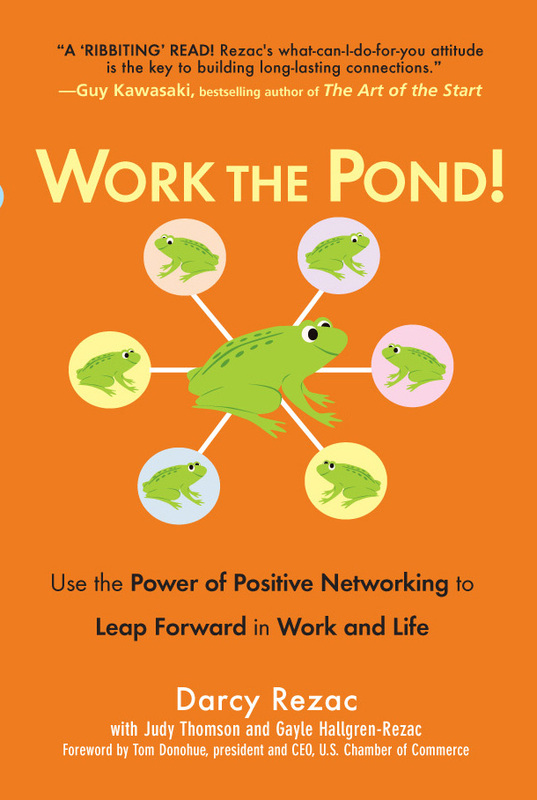 He takes the frog analogy much further (a bit too far at times) but the book remains extremely insightful in its description of networking misconceptions and how one can become a networking expert. Another grea t analogy that I’ve seen that helps us better understand the act of networking is the article Breaking Away: Networking like a Cyclist, by Daniel Ransom on the library blog Letters to a Young Librarian. I am an avid cyclist and so I can really relate to these lessons about networking when compared to competitive cycling (a little shoutout to Ryder Hesjadel, the first Canadian to win the Giro d’Italia, Woohoo!). People often do not realize that cycling is often played as a team sport and that there is a lot of strategy involved. I think that this blog post does a wonderful job of comparing the fine line between working together to move forward and the drive needed at the end of the race to leave the group behind and cross the finish line first. This strategy exists both in cycling and during a job hunt. One thing that both Rezac and Ransom touch on that I completely agree with is that networking does not have to mean focusing your energy on talking only to the “big wigs” who you consider to be the most influential. Networking is often about making contacts (friends) who might be at the same level as you so that you can support each other as you both work your way up. Sometimes will you end up competing against your friends for a much coveted position but life goes on. I highly recommend both this book and this blog post to gain easy and effective networking tips. I had an awesome time at the Librarians Without Borders event “Innovation from the Margins” last Friday. To find out more about the event and the speakers, check out the blog post that I wrote for the LWB website. Save the planet and your precious time – Recycle stuff! One evening last week I was busy putting together a presentation for a few grade 7 classes on how to use the Internet effectively for research. I was definitely under a time crunch as the teacher had asked me with very little notice if I could do a presentation with her classes. Never one to turn down an opportunity to help the students develop their information literacy skills, I accepted. The only problem was that I was stuck. My ideas weren’t flowing, I was having trouble coming up with an interesting concept for the presentation and I was getting tired and frustrated. That is until I remembered that during my second year of McGill University’s MLIS program I had already put together a presentation for high school students on evaluating websites for my Information Literacy class. Luckily I was able to find the presentation saved on my laptop and to my sheer delight, it was a great presentation! I definitely had to tweak a few things but everything I wanted to share with the kids on establishing the criteria for a good website to use for research was there. Even the examples of websites that I had used a few years ago for my assignment were still relevant. The example of the article on Barack Obama on the website Conservapedia was especially useful in helping the grade 7s understand the difference between websites that present objective vs. subjective information regardless of how “professional” a website might look. Way to go 2010 Amanda! During library school, students are often asked to “make up” a fictional library or scenario for assignments. My advice to students is to try and take advantage of these types of assignments to prepare material that might actually be of use to you at a future date. So many students simply go through the motions when it comes to completing their assignments. However, if you truly think that your work might serve you in a professional situation then you will put a lot more thought and effort into it! Use your class assignments to create tutorials, information literacy presentations, strategic planning charts, etc. that you can “recycle” when you need them most. For professionals, I encourage you to take a peek at your old assignments (especially if they are still on your computer). You might be surprised at how well written something is that you wrote while still in school. The whole point of library school is not to get straight As but rather to give us a foundation for our professional careers. So then, with all the things we need to accomplish in a day, aren’t we lucky if our MLIS assignment that we got a A on could also save us time? Have you ever recycled an assignment for professional use? I am a graduate of McGill University's Masters of Library and Information Studies program. I run two school libraries in Toronto, Ontario. I'm interested in everything library related from Children Services, to Collection Development, to Information Literacy and beyond. Agree with me, disagree with me, but don't be indifferent!